← Doing anything nice this weekend? 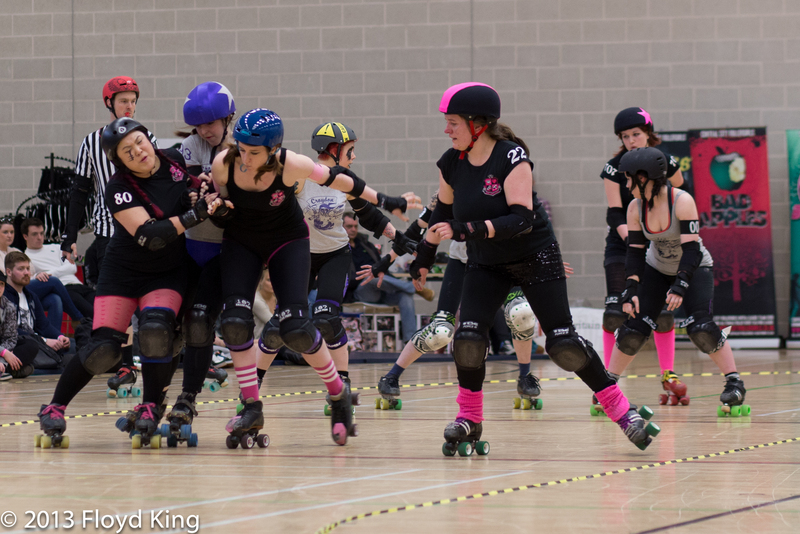 On Saturday 6th April, Central City Rollergirls (CCR) played host to two teams at their regular home venue in Birmingham. New opponents Croydon Roller Derby (CRD) took on the Slay Belles and familiar faces Middlesbrough Milk Rollers (MMR) took on the Centrinnians. CCR ended the day with mixed results, with CRD coming out victorious over the Slays but the Centrinnians finishing the day on a high taking the win over MMR. CCR and CRD had not met on track previously but both teams looked in high spirits going into unknown territory. It was CRD who got off to a dominating lead that saw the Slays scoreless for several jams at the start of the game. CRD’s walls continued to delay CCR’s jammers which enabled them to extend their lead in the first half. Just before half time CCR managed to claw back some of the deficit following a 20 point power play and the scores at halftime stood at CCR 30 – 167 CRD. The Slays came out of half-time looking much more focussed, determined to get some more points in their favour. At this point in the game their determination was rewarded and another power play just after half time narrowed CRD’s lead over the Slays. However, although the Slays managed to slow CRD’s scoring compared to that of the first half, CRD’s walls stayed strong and jammers nippy. CRD maintained the big lead they had built in the first half to secure the victory with 270 points over CCR Slay Belles’ 96. CCR Roster: 1337 Incredible Hulse (Captain), 191 Bex Luther, 1212 Lola Whip, 1832 Emmraa, 22 Em On Bread, 25 Faze’Her, 28 Betty Bloodshed, 286 Charlie Scraplin, 44 Nokturnal, 5000 Boots Manuva, 61 Erin Block’hervich, 80 Skar Siren, 707 Jelly Mean, 99 Weston Super Clare. Bench: Captain Cageman. LUM: Madame Flutterby. 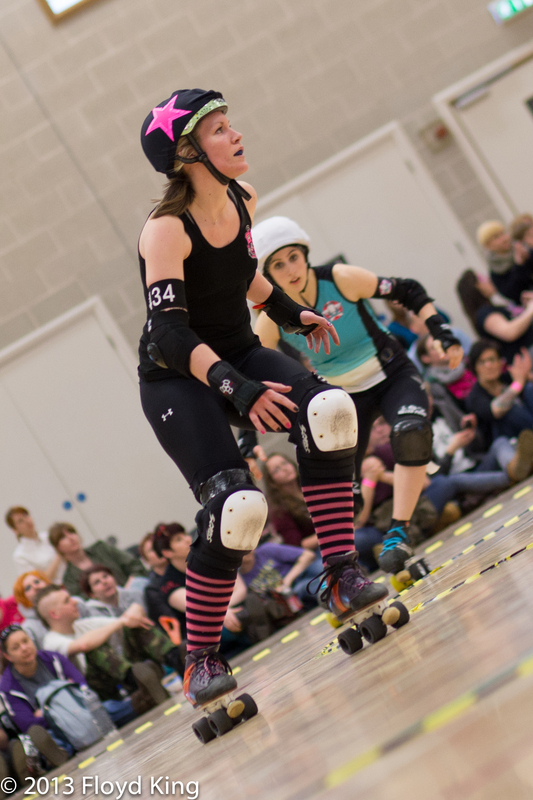 Many moons ago CCR and MMR entered collaborative teams in Roller Derby tournaments, back in the days when leagues struggled to fill sports halls during practices and field a team at bouts. On Saturday 6th some veteran fans could be seen sporting their joint CCR/MMR tee shirts from these occasions. However, a lot had changed on both squads since then. New faces, tactics and levels of determination were in force in the second game of the day which saw an exciting bout with many lead changes that kept fans on the edge of their seats. Scores crept up slowly to begin with quite a few 0-0 jams, a sign of the tough defence from the closely matched teams. The first sizable lead of the day went to CCR following a power play. Tight pack work and an empty penalty box for CCR helped them capitalise on this lead in the next few jams, drawing their score out to 62 – 15 before MMR could respond. MMR clawed back the deficit with a huge power play of their own and in the subsequent jams regained the lead, CCR 62 – 71 MMR. A power play for CCR just before half time meant the scores stood at CCR100 – 71 MMR at the close of the half. Both teams started the second half strong, knowing the win was in either team’s grasp with a close scoreline. CCR held their lead for the first 15 minutes of play but an MMR power play saw them close the gap to just one point. MMR kept up their momentum following this and took the lead for the first time since the first half making scores CCR 123 – 140 MMR. The scores stayed similar to this for the next 10 minutes of play with both teams fighting hard to score but MMR keeping their opponents at bay. In the penultimate jam of the game, a forced track cut gave CCR a power jam, and the crowd exploded as the Centrinnians managed to regain the lead CCR 180 – 173 MMR. The last jam of the game saw CCR’s jammer emerge from the pack first to get lead jammer status and CCR ran down the clock until they could be sure to keep this advantage. The game closed with two exhausted teams and the scoreline CCR 191 – 181 MMR. Enjoyed the last game? Want to support your local Roller Derby league? CCR are holding a fundraiser on 20th April where you can do just that! Join us for a night of belly laughs and beer as CCR host their second comedy event of the season, more details available on the Facebook event here: http://www.facebook.com/events/317444211718576/ Hope to see you there!